Earlier to day our TFS server went down. Visual Studio likes to have a constant connection open to it, but obviously that wasn’t going to happen. Luckily, it is possible to work on a solution with no connection to TFS. When TFS is available again you can simply reconnect to the server by selecting the Team?Connect to Team Foundation Server… menu. Once you are connected, you can right-click the solution and select “Go Online“. It will then take a few moments for TFS to catch up (I have quite a large solution, so it took about a minute for me) then the files appeared in the Pending Changes window ready to be checked in as normal. If you already had files checked out when TFS went offline then this post about converting to offline may be more useful to you. There is also a Visual Studio extension, if you prefer not having to restart Visual Studio called Go Offline. 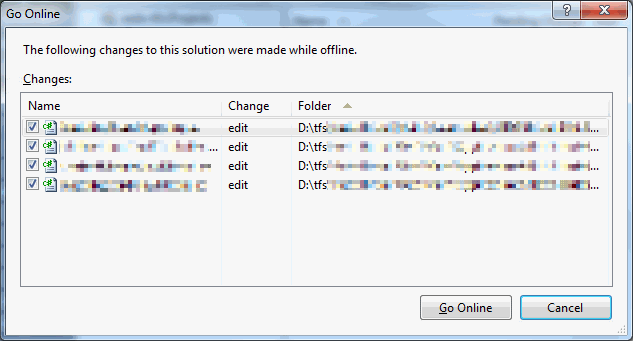 Once installed, just to to File?Source Control?Go Offline. This may be a more useful solution if you are constantly going in and out of connection with TFS (a mobile broadband connection on a train for example). Wow…Such a non-informative article is rare to be seen. It has no relevance to the title at all, and no useful information besides the link to an extension. Bad job mate, please fix it. I can’t please everyone. If you didn’t get useful information from my blog then feel free to move along to the next site. I write mostly as an aide-mémoire to myself. If it helps others then that’s great, if not then… C’est la vie.